Our range of products include non woven geotextile, geotextile needle punch - non woven, needled felt, civil work non woven geotextile, geotextile for soil erosion control and geotextile fabrics. Size (inch) 40" to 120"
We are manufacturing variety of Non-woven Geotextile Fabrics as per the specifications prescribed by Agencies. Our Geotextile fabrics made in Polyester, Polypropylene, etc fibers and have various applications in river bank projects, structures and on various geo technical materials such as soils, rock, earth etc. Geo-textile fabrics are either used to restrict or allow passage of water, as desired. We have an intensive experience in this industry: we can fabricate a durable range of Needle Punch Non Woven Fabric Felts. Our experts are involved in testing these on various parameters of quality in order to ensure their durability and reliability. All These products are fabricated by using premium quality raw material sourced from our reliable vendors. Further, we offer these products at the most competitive prices. We are one of the leading Manufacturer of Non Woven Needle Punched Felt in India. 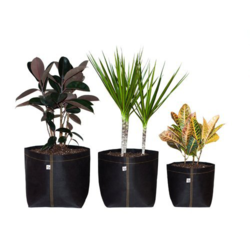 Manufactured from high tenacity UV stabilized virgin polypropylene or polyester fibers which have been heavily drawn to ensure excellent long term durability in all soil types. Manufactured using a randomly orientated web to provide completely isotropic properties, ensuring that high strength is not limited to a single direction. Excellent uniformity with high permeability and low pore size for soil filtration. We are providing Quality Geotextile for Soil Erosion Control. Our fabric can be easily put between rip, rap armor rock which prevents erosion of soil beneath it. Our Geotextile Fabrics for Soil Erosion Control is very economical than other available granule filter materials which are expensive and difficult to use. Geotextile Fabric acts as a filter to allow water to move in either direction and as a separate between soil. Can be used for protection of stream banks, shore lines, slopes, construction sites, pavements, open pit mining, etc. Needle Punch Geobags has excellent water permeability, can be widely used in, dams, hydraulic construction and tunnel in a coastal beach, land reclamation and environmental protection projects, reservoirs, canals, dams, Bank protection, Coastal engineering. • Higher Resistance to ultraviolet degradation and biological chemical environment normally found in soils. 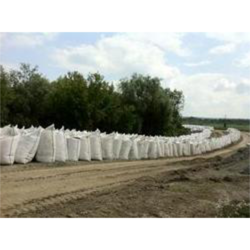 Our Geobags for River Banks and Flood Controls have high strength and durability for holding all kinds of sand particles. Geobags are made from Polyester or PP fibre or blend of both as per specification and user requirements. We also provide high tenacity Needle Punch fabric for making Geobags. 2. Can be made avaliable for all places. We are the manufacturer of Geotextile fabric which is used for Containment system That nonwoven Geotextile can help with your difficult waste containment problem.
. Landscaping, Retaining walls, Urban Landscape and Parks Containment.
. Within the welded wire mesh filled with stone or natural cobblestone highway together protection, slope, roadway, bridge and so on.
. Geotextile is also widely used in earth or soil reinforcement such as desertification, slope protection, river, Containment, Coastal protection, reservoirs, Canals, and Pipelines renovation. Our range of products include Geo Bags Geo Textile Fabrics such as Geo Textile, Non Woven Geotextile Fabrics, Non Woven Fabric, Geo Textile, Soft Roll, Strobel and many more items. We manufacture quality Non woven geotextile from polypropylene/ polyester staple fibers, which are mechanically bonded through needle-punching to form a strong, flexible and dimensionally stable fabric structure, with optimum pore sizes and high permeability. 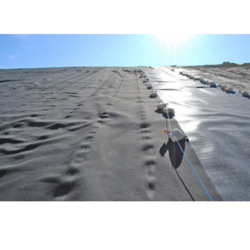 PP Needle Punch Geotextile has excellent water permeability, filtration, durability, can be widely used in railway, highway, sports hall, dams, hydraulic construction and tunnel in a coastal beach, land reclamation and environmental protection projects. 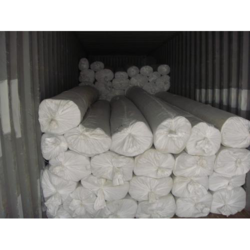 Polyester Geotextile Fabric is available from 100Gsm to 600Gsm. Made from Virgin Recycle Polyester Fibre as per the requirements of the Project Contractor. All testing facilities available for finding the best suitable fabric. 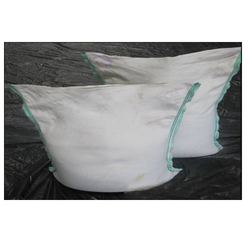 Suitable for all kinds of Geotextile like Geotextile Geobags, Geotextile Geosand fabrics, Geotextile Geosynthetics, etc. Non Woven Needle Punch fabrics available for Water Proofing Membrane above HDPE Liners. 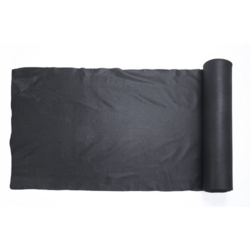 Our Fabric Protect the HDPE Liners which is a water proofing material from breakage and damages. We are Manufacturer and Supplier, We are providing our clients with Polypropylene Fabric. By making use of polypropylene in the manufacturing process of these fabrics are sourced from the Reliable Vendors of the Industry. Further, Our clients can avail these fabrics from us in different lengths as per their demands at Market leading Prices. 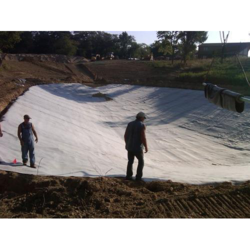 We are engaged in manufacturing of water proofing Geotextile used in Membrane protection. It’s High quality Production. 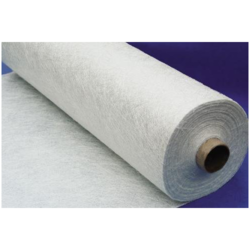 Non Woven Needle Punch fabrics available for Water Proofing Membrane above HDPE Liners. 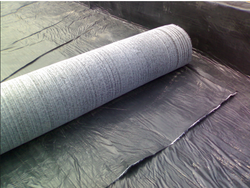 Our Fabric Protect the HDPE Liners which is a water proofing material from breakage and damages. 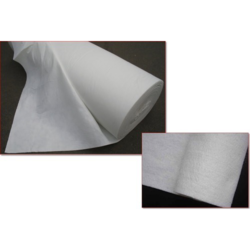 Engaged as a manufacturer and supplier, we are providing our clients with Non Woven Geotextile Fabric. By making use of Polyester in the manufacturing process of these fabrics are sourced from the reliable vendors of the industry. Further, our clients can avail these fabrics from us in different lengths as per their demands at market leading prices. The nonwoven Geotextile are usually used together with Geonets or Geo cell as the Geocomposites. It is often laid above to protect the geomembrane from surrounding damage. 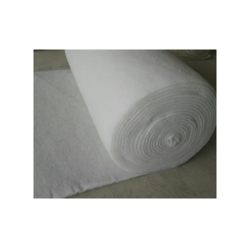 We Offer wide range of Pet PP Geotextile fabric, It has good vertical and horizontal drainage performance, good tension performance and good chemical functions such as aging resistance. It also has wide whole diameter range, zigzag Gap Layout and good Penetration and filtering performance. Anti-filter: Protect Earthwork net below landfill yard that has seepage, prevent Earth particle from entering, Protect Earthwork Composite Material, and prevent Earth particle from Entering. We are widely engaged as a manufacturer for Geotextile Road Fabric, Our manufacturing capacity is large in volume. 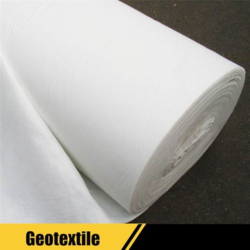 Geotextile has excellent permeability, acquired, durability, which can be widely used in Road Construction, railway ,highway, movement hall, Dams, Hydraulic structures hence hole, coastal shoal, reclamation, environmental protection and other projects. 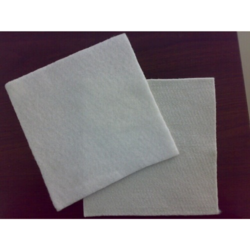 The main products are Synthetic staple fibers needle punched nonwoven Geotextile. By keeping track with the market developments, we are engaged in offering an extensive range of Non Woven Geotextile. Our professionals manufacture this product using high class fabric with the help of latest machines and technology. The Tank Lining Fabric is available with us in different sizes, designs and patterns to meet the diverse requirements of clients. We provide this product at industry leading price to the clients. Non Woven Geotextile are manufactured from virgin Polypropylene / Polyester fibers-needle punched to provide a dimensionally stable fabric. It provides optimum strength. Geotextile are highly used in Geotextile for Subsurface Drainage drainage pipes as a permeable separator to keep soil out of the drainage media, but permit water to pass freely. Uncontrolled ground water is destructive so subsurface drainage in needed under highways, parking lots, shorelines. etc. 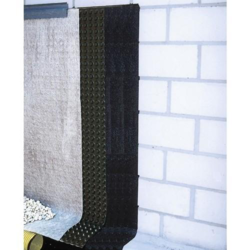 Geotextile wrapped around the pipes, an effective and long lasting drainage system is ensured, without any risk of clogging. 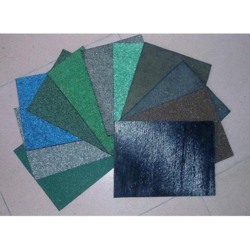 Paving fabrics are non woven, needle-punched polypropylene fabrics that have history of improving Pavement performance and extending pavement life. Properly installed, paving fabrics are an important part of an overlay system that can. 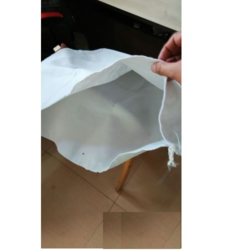 Geotextile Non Woven Fabrics can be used in Construction of Airfields, this fabric is convenient, because the material is qualitative light, and soft, transporting, laying, construction is convenient. We are offering wide range of Non Woven Calendared Fabric. Our expertise of this domain has enabled us to offer a collection of calendar non woven fabric. As the name recommends, these are made using finest quality non-woven fabric. 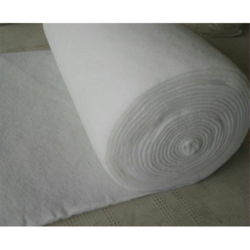 Polyester Fiber Geotextiles are made from 100% staple Polyester and Polypropylene Needle-punched filter fabric. They have excellent Water flow rates and drainage for the filtration of soil fines. Polyester Non-woven Geotextiles have a variety of uses, some of which include trench drains and wrapping perforated pipe to protect against erosion and being combined with Geomembranes to provide protective cushioning. Other uses include tensile reinforcement, filtration, and separation for roads, roofs, railroads, ponds, dams, trenches, landfills, protection for shoreline and membrane liners, sub-grade stabilization, erosion control, and many other civil engineering and construction uses. This product is resistant to tears and punctures, soil chemicals, UV rays, mildew, and freeze thaw. 1. 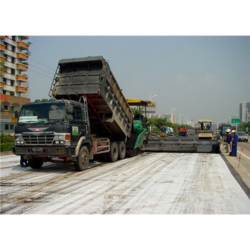 Geotextile non woven fabric is used in roadway construction. 2. Geotextiles have multiple advantages when used in roadway projects. They can extend the life of the paved road by helping to reduce the number of potholes. 3. Using these non wovens have the potential to significantly reduce the number of times roads need to be repaired. 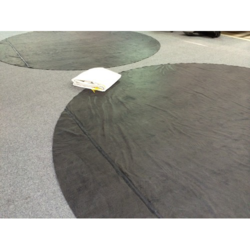 Engaged as a manufacturer and supplier, we are providing our clients with Geomembrane Fabric. By making use of Polyester in the manufacturing process of these fabrics are sourced from the reliable vendors of the industry. Further, our clients can avail these fabrics from us in different lengths as per their demands at market leading prices. The nonwoven Geotextile are usually used together with Geomembrane, Geonets or Geo cell as the Geocomposites. 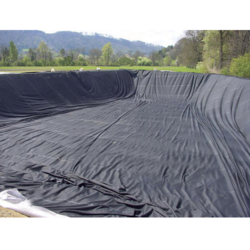 It is often laid above to protect the geomembrane from surrounding damage. We are engaged as a manufacturer of Geotextile fabric Sheet by using Non Woven Production Techniques. Needle punching for Non-woven Geotexiles, the main raw materials are Polyester staple fiber or polypropylene fiber and use needle point method to make them. The main function are: slope protection for waterproofing, river, sea and lake, reclaiming land from the sea, project of emergency flood fighting for port or ship lock. Conserve water and soil. 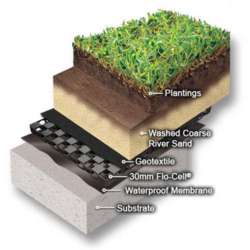 A Geo waterproofing membrane is a very good physical means of protecting your foundations against moisture. Simple tarring offers no protection against moisture because water can infiltrate through the tiny cracks that naturally form in concrete and to an even greater extent through larger cracks. Furthermore, tarring cannot protect against the risk of infiltration if there is too much water around the foundation walls. 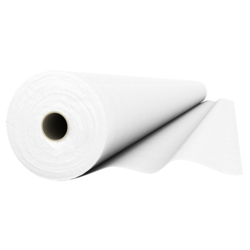 Geo-Wrap is a roll of waterproof polypropylene membrane with two distinct sides: the smooth side that is placed against the wall and the honeycombed side, coated with a geo-textile, that is placed in contact with the soil. With the Geo-Wrap membrane, your foundation wall is no longer in contact with the soil. The risks of infiltration and of moisture seeping into your basement are therefore greatly reduced. 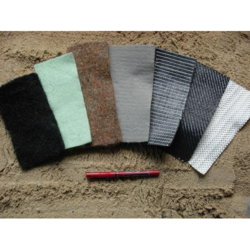 We are involved in offering Geotextiles that are used in Landfill process. 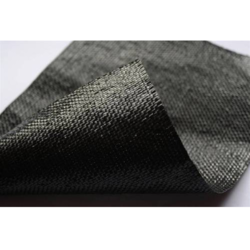 The Non-woven Geotextiles are manufactured from high quality polypropylene staple fibers and are mechanically bonded through needle-punching to form a strong, flexible and dimensionally stable fabric structure, with optimum pore sizes and high permeability. • Geotextiles serve a number of important functions in all types of landfill applications: Used in the areas of highway, railway, dyke, and water project construction, tunnel for its reinforcement, filtration, isolation and drainage.• Protective layer to prevent Geomembrane liner damage.• Permeable separation layer to preserve the layers in Landfill design• Drainage filter to facilitate flow through drainage systems and Geonets• Filtration layer to prevent clay or soil intrusion.• Landfill daily covers to provide overnight surface confinement. Geotextiles are permeable fabrics which, when used in association with soil, have the ability to separate, filter, reinforce, protect or drain. Typically made from polypropylene or polyester, Geofabrics come in three basic forms: woven (looks like mail bag sacking), needle punched (looks like felt), or heat bonded (looks like ironed felt). 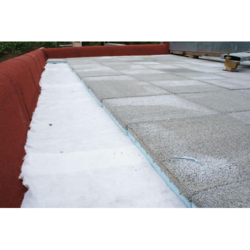 Geotextile for Water Proofing: Protection coatings and membranes applied to concrete structures are often in need of protection. Sharp objects in contact with the proofing, whether by design or by accident, are capable of penetrating the barrier, particularly if the structure is subjected to high confining pressures. 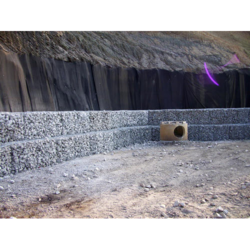 Filter Fabs Geotextiles are widely used as they provide protection during installation and ensures optimum puncture resistance at minimum cost. Whether it's a polymeric or a bituminous membrane, applied vertically or horizontally, above ground or below, protection to prevent puncture will be required on one or both sides. Ginni Spectra has The state-of-the-art high speed needle punching production line is adopted, its roll width is up to 8 Meters. The non woven Geotextiles are made by non-woven process technology, selects polyester staple fiber with high monofilament strength and excellent thickness ratio as raw material after underwent adequate Scotching. We can manufacture PP Nonwoven Needlepunched Geotextiles on PP Staple Fiber Needle punched Technology. Needle-punched non-woven Geotextiles are made from polypropylene fibres that are tangled together by a needle-punching process. The fibres may be made in continuous or short lengths (the short length fibres are called staple fibres) and achieve their strength by interlocking. 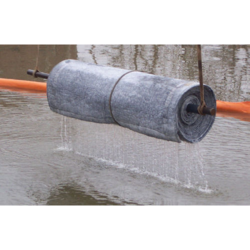 Needle-punched non-woven Geotextiles have excellent water flow rates and are used for filtration of soil fines for drainage applications including trench drains, as a wrapping for perforated pipe, for erosion protection, and combined with three-dimensional structures to create prefabricated drains. They are also commonly used with geomembranes to provide a protective cushion. Needle-punched non-woven primary functions: filtration; separation; protection; drainage. Secondary functions: reinforcement. 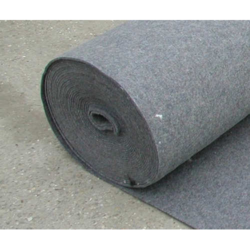 PET Geotextiles Fabric is a continuous filament nonwoven needle punched polyester paving geotextiles, which provides stress relief, waterproofing and reduces reflective cracking functions in new and existing paved roads. Designed for countries having extreme weather conditions in mind, the product has undergone a number of years of testing and refinement to provide the best overall performance. The unique properties of these Geotextiles provide waterproofing and stress relief of the pavement structure. 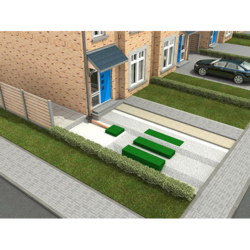 The high melt temperature of Polyester (PET) ensures that the geotextiles properties are not affected by the application of hot bitumen or asphalt. It can be the filtration layer of the dykes, river canal, seacoast, concrete slope, retaining walls. At the same time of preventing the clay granule from passing, it allows the water and the gas pass through freely. Ginni Spectra Pvt. 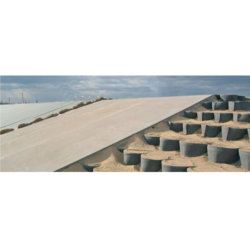 Ltd. offers a wide range of Geotextile. Geotextile are used in building demolition, geotextile fabrics in combination with steel wire fencing can contain explosive debris. They are even used for water roofing.And these products are in huge demand.